During the week of March 5, 2007, Mickey, a 4-1/2 year old little boy became sick. After taking him to his pediatrician on Wednesday March 7th, he was diagnosed with a "stomach bug" and was told to come back later in the week if he did not improve. On Friday, March 9th he was taken back to the pediatrician only to be told that he now had a respiratory infection and was transferred by ambulance to Vassar Brothers Hospital (VBH). During his evaluation at VBH he stopped breathing and had to be intubated and was immediately air-lifted to Westchester Medical Center Children's Hospital, where he remained on the respirator and underwent 2 days of various tests. On Monday, March 12th he was diagnosed with Leukemia ALL, along with the respiratory infection and they immediately started chemo treatment via spinal taps. 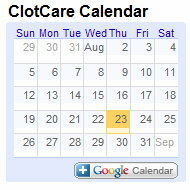 He remained in ICU for 3 weeks on the respirator, at which time he developed a blood clot in his left leg. At the end of the 2 weeks they tried to remove the ventilator and he arrested and had to re-intubated and chest tubes had to be inserted, while continuing his cancer treatment and was continued to be kept in a medically-induced coma. After 4 more weeks he was taken off the vent, and put on a V-Pap breathing machine only to find out that his epiglottis and vocal chords were damaged during this process. He was being tube-fed. He was then transferred to the Children's Cancer ward at WMC, where he stayed another 2 weeks. On Friday, May 11th, he was released home, unable to eat, speak, or walk. After intense homecare for 3 to 6 months of PT and with the assistance of communication and speech/swallowing therapy, he was able to speak and started to swallow. He remained on the feeding tube through September but food was only introduced the end of August. He is now able to walk, talk, and eat by using the "chin tuck" method of swallowing. He continues his cancer treatment and has 2 shots of Lovenox everyday due to the blood clot in his leg. He will continue his cancer treatment for another 2 years. 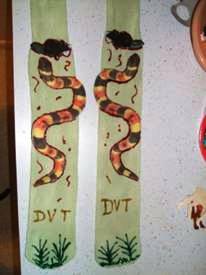 He is very fond of animals so when my department was asked to make a pair of socks for DVT awareness month, I thought this would be a great project for us to do as a family. 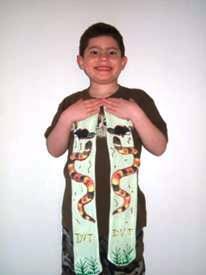 He wanted to make his socks with animals....the snake represents his vein and the rat is his blood clot that he "would like the snake to eat and get rid of."